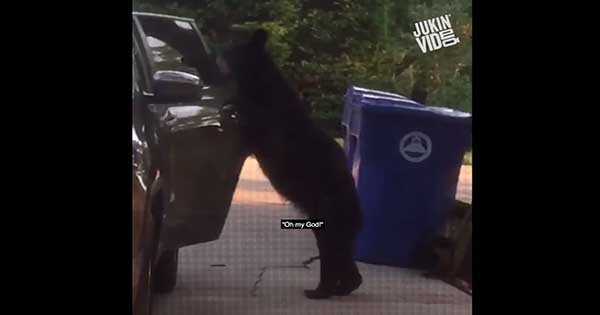 Intelligent Bear Opens A CAR Door! - Muscle Cars Zone! Intelligent Bear Opens A CAR Door! Bears are usually considered as wise animals, especially when it comes to finding food in our yards and they are literary capable of doing everything just to get to some food and that is why we take a look at the following video and we see a very intelligent bear getting inside a car. We have seen numerous videos of animals trespassing inside our properties, usually ending up damaging something or injuring themselves. But the following video might give us a proof that bears are really smart and are capable of more. Several people started filming probably due to the fact that they saw a bear inside their yard but they most certainly did not expect to see the bear entering into someone`s car. At first the intelligent bear sneaks around the garbage cans which was attracted by the smell inside. But what followed next amazed everyone. The bear stood up standing just on the back legs and suddenly put its hand on the door handle and opened it. The guy filming started shouting to the owner that there was a bear inside his car. Probably there was some food left inside the car which is why the smart bear got inside at the first place. Their sense of smell is so sharp that they can smell food which is miles away. The people did not know what to do. But just seconds after the bear got outside the car without anything. Make sure the next time you park your car not to leave any food inside! Finally, check out this moment of fear and the chat between a man and a bear! Didn't even bother to shut the door behind her!